Writer Lance Scott Walker has collected stories and interviews from Houston's rappers, DJs, producers, promoters, and record label owners since 2005. 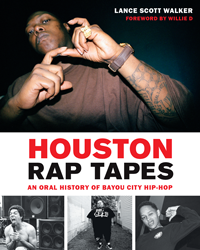 In the new amplified edition of his book HOUSTON RAP TAPES, he includes new photographs and interviews (Scarface, Slim Thug, Lez Moné, B L A C K I E, Lil’ Keke, and Sire Jukebox of the original Ghetto Boys), plus custom maps of Houston that highlight major landmarks for the city's hip-hop culture. Recorded on DJ Screw's birthday, this conversation addresses how police corruption and gentrification have impacted the Houston neighborhoods that gave birth to Houston rap, tracing the scene from early rap battles among Raheem, Willie D, and Vanilla Ice to the up-and-coming H-Town artists making beats and rhymes today. We also cover the complexities of gangster rap, the women who shaped the scene and are making music on their own terms, and the impact of the late DJ Screw.